So, you’re planning on going to Tokyo? You’ve found the best place to stay in Tokyo and now you want to find some great food places. First off, congrats! I’m so jealous. Tokyo is one of my all time favorite cities. There is so much to do, so much to see, and most importantly, so much to eat. Check out a Tokyo city guide before you go to make sure you don’t miss out on any cool things to do. Tokyo has it all, from hole in the wall gyoza places to high-end Michelin sushi bars. If you’re planning on going to Tokyo and are staying in something like these hotels in Shinjuku, plan on eating, because eating is half the fun. Warning: this is a LONG post! A quick note on planning: keep your expectations low. I don’t mean that the food is going to be bad – quite the opposite in fact: the food is going to blow your mind. It’s the expectation that you’ll be able to find the places that you want to eat at that most likely won’t be met. The addresses in Tokyo are very, very peculiar. Don’t forget to look up if you’re looking for a restaurant. Many times they’re tucked away on the second floor or higher. Not everything’s at street level. In fact, I’d say that a large majority of places aren’t. Google Maps helps if you have internet. And if you don’t, most people are friendly enough to help you out, as long as they’re not in the middle of something. With all that said, here are some of Mike and my favorite places in Tokyo. I can’t believe it’s been three months since we moved back and I’m only now getting around to making a list of my must eats. A quick caveat: this is by no means an exhaustive list – I left out lots of places that are delicious. It’s always fun to wander around and just pick a random joint, so I definitely recommend that. Pro tip: If you want lots of variety (which is something many foreigners complain about because most restaurants are single dish oriented. If they specialize in katsu, you’re only getting katsu so good luck if someone in your party doesn’t like katsu when you’re at the katsu place) head to a depachika, the basement floor of any good department store. There’s a massive amount of take-out food that is affordable and delicious. The only issue is, there don’t have any where to sit. But, if you take your food upstairs, most department stores have a rooftop garden or seating area. I’ve talked about it before, but I thought I’d give it another mention. It’s a cute little sushi-ya run by Chef Keiji Nakazawa. It’s been rumored that he kicked out the Michelin reviewers for being too ignorant about sushi, but rumors are rumors for a reason. Regardless, the lunch set here is what I tried and enjoyed. Bara chirashi is a rice bowl topped with tiny bite sized pieces of seafood, vegetables, and fluffy omelette strips. They only make 20 bowls a day, so if you’re interested, make sure you get there at the 11:30 opening time. They also do omakase at dinner, which is quite a bit more expensive, but also super lovely, so I’ve heard. Other sushi places: If you’re going to Tokyo, you’ve probably heard of Tsukiji, the fish market. If you’re ever up early in the morning due to jet lag, head on over and treat yourself to a sushi breakfast. The most popular places are Sushi Dai and Daiwa Sushi, but the lines are notoriously long. You could hop on into any sushi joint – the fish is incredibly fresh, or you could easily snack your way through the market. One of my must haves is tamago-yaki, a fluffy savory-sweet omelette. Tonkatsu, for the uninitiated, is panko-crusted, deep fried pork cutlet. It’s crispy, crunchy, juicy and so, so delicious. Tonkatsu is basically a Japanese take on schnitzel. It’s typically served with fluffy white rice, piles and piles of finely shredded cabbage, pickles, and miso soup. Usually, you pick between rosu-katsu (loin) or hire-katsu (filet). Rosu is juicier and has more marbling whereas hire is a bit more lean. It’s funny, because when you look at a tonkatsu menu, you might think that everything looks the same (a la that scene in Lost in Translation), but really all the cuts taste different. Really though, you can’t go wrong with crispy juicy deep fried pork and addictive tonkatsu sauce. And ooh, don’t get me started on the sesame seeds – they give you a little mortar and pestle for you to grind your own sesame seeds to add to the sauce. Heaven. There are a ton of tonkatsu specialty houses (Maisen, Butagumi, Kimukatsu, Tonki), but we like visiting the Wako in Mark City. One of the awesome things about awesome things about Tokyo are the lunch specials. Lunch is always cheaper, a little more casual, and just as delicious. Tenshige, in Akasaka, is scrunch-your-fists-up delicious. 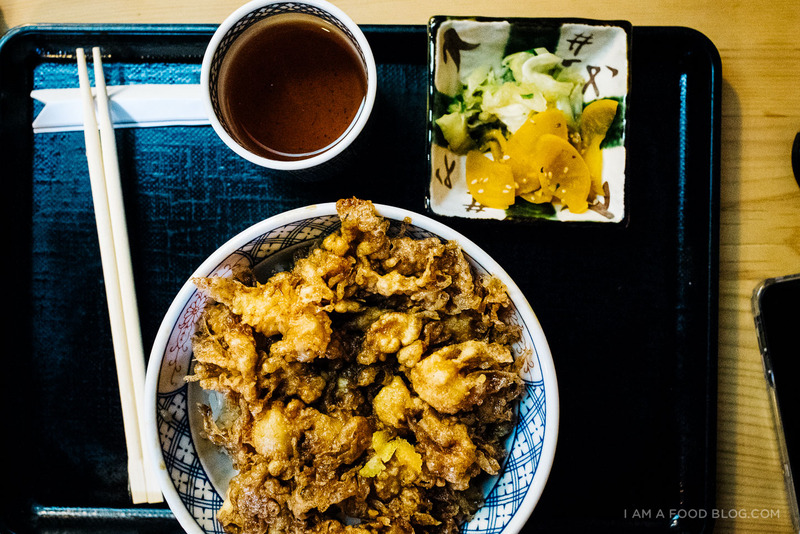 They offer two bowls at lunch: tendon and kakiage. As with so many other choices on menus in Japan, it seems like the difference is imperceptible. But there’s actually is a difference: tendon is separate tempura pieces on rice and kakiage a mix of prawns and shellfish in a tempura cake. Both are dipped into a vat of secret recipe tempura sauce making for an addictive bowl of piping hot texture contrasts. The crispy-crunchy batter holds up to the sauce in some spots, and soaks straight to the tender seafood in others. They pop on a tiny touch of yuzu peel for a bite of brightness and the pickles that come with are a welcome foil. It’s a warm, tiny room run by three women chefs (hopefully you get a seat at the counter) who are efficient and super friendly. They don’t speak English, but seeing as there are only two options, you can pretty much get by. Don’t say no to the miso soup when they ask – it’s delicious. Oh, and as with anything good in Tokyo, expect a bit of a line up! By now I’m sure you’ve heard of Omotesando Koffee, a tiny box of a coffee shop located in the back streets of Omotesando, Tokyo’s answer to New York’s Soho. The main street, Omotesando, is home of plenty of luxury goods stores, but the back streets are filled with eclectic design stores, strange and wonderful local clothing stores, quirky restaurants and cafes, and of course, Omotesando Koffee. Omotesando Koffee is run by one Eiichi Kunitomo, the owner, barista, and conceptualizer. 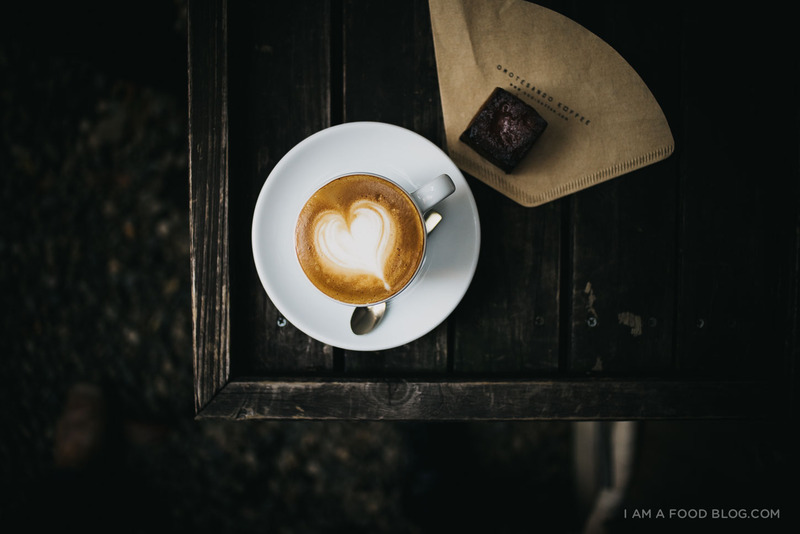 He makes a damn good cup of coffee and a delicious square take on the French caramelized custard pastry, canele. Even if you didn’t want to get lost looking for coffee in the charming back streets of Omotesando, I would still recommend you try to make it to this shop. It’s housed in a old Japanese home, the insides striped bare to hold a singular wooden (k)coffee kiosk. The tiny Japanese garden just inside the courtyard has a cozy bench for two. There’s something immensely profound about finding a quiet spot in one of the busiest cities in the world. It’s the perfect place to enjoy a coffee and bit of quiet contemplation with your favorite travel companion. UPDATE: Omotesando Koffee is now closed but Eiichi Kunitomo, the owner, has started a new concept called Koffee Mameya in the completely reconstructed space. It’s a beans shop. You can still get cups for pour over coffee, but the focus is on the beans. They speak excellent English here (if that’s your kind of thing ;)) and you go up to the counter and tell them how you make your coffee at home and what sort of flavor profile you like. There’s a little bit of conversation about which beans are best for you and then they’ll make a custom recipe for how you will prepare your coffee at home. Don’t forget to buy a cup of koffee to taste so you can compare how you do at home to the cup the experts make. Also, if you’re still fiending for Omotesando Koffee, head over to Toranomon Koffee, where they still do all the coffee drinks. Read more about it here! Momose is one of those hard-to-find gems that often has a line up – even at lunch (I know, I know, everywhere in Tokyo sounds like this!). The line is definitely warranted though. Momose serves up some of the best tempura that I’ve ever eaten. Like everywhere else we go to with a purported line, I made Mike go early. We arrived early, found the tiny shop down a stairwell and when there was no line, Mike insisted that we visit the nearby shrine. I couldn’t really enjoy it though, I felt antsy about missing out on the first seating. When we went back, the signboard was out but there was still no sign of anyone so we went through the door and luckily, there were two seats for us at the bar. I absolutely love sitting at the bar in tempura joints. It’s where all the action is and you really see the care and preparation that goes into each and every item. Mike and I both had anago baraage-don, tempura salt water eel. It was crispy and delicious, especially with the giant pile of shredded shiso. Lots of people were ordering the tempura set as well as kakiage and tendon. You basically can’t go wrong, especially at lunch, when the cost is a fraction of what it is at dinner. I’m a huge fan to Totoro. His happy chubby little body always brings a smile to my face. So, of course, when I discovered that I could eat him in delicious cream puff form, I absolutely had to make the trek out. I’ve been going to this cream puff factory (and dragging Mike along for the ride) ever since my first visit to Tokyo back in 2011. The cream puffs are both adorable and delicious. They’re extra crispy thanks to a mold (you can sneak a peek into the kitchen and see a bunch of upside down Totoros waiting to be filled) and their insides are a smooth and silky pastry cream. They usually have vanilla and chocolate and two rotating seasonal flavors. You can’t go wrong with classic vanilla, but the chestnut happens to be my favorite! A funny thing to note about Japanese people and Japan in general: people don’t eat on the streets. They think it’s rude. You’ll never see someone with a bag of chips walking down the street. Or a hotdog. There are a couple of acceptable things to eat while standing on the street (and maybe even walking). If the first is ice cream, the second is definitely taiyaki. Taiyaki are piping hot, freshly made hotcakes filled with a variety of flavors. They’re shaped like fish, which is why they’re called taiyaki – taiyaki is literally traslated as grilled sea bream – but they’re not fishy at all. Made with a batter that’s similar to pancakes or waffles, the fish-shaped treats are filled with things like sweet azuki beans, custard cream, and the like. You can usually smell them from a mile away and there’s a store over a hundred years old that specializes in taiyaki. If people are lining up, it’s a good sign. Once you’ve had your fill of taiyaki, please, please, please have a croissant taiyaki. 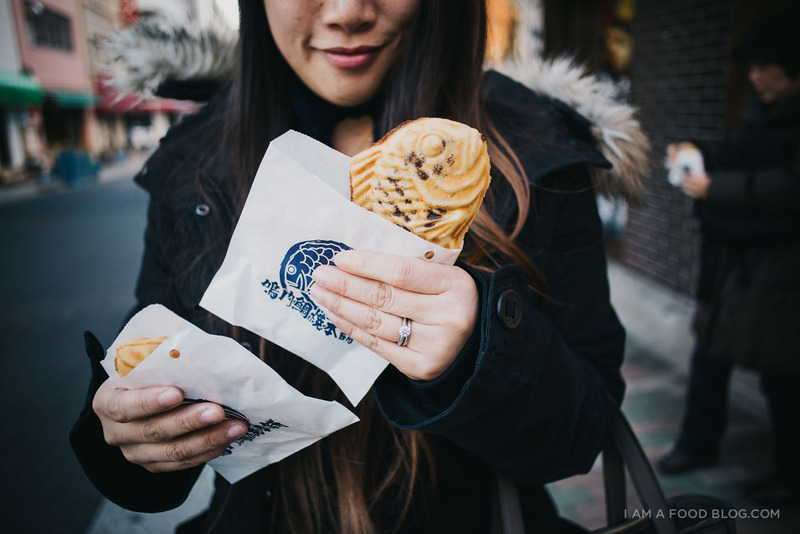 Like the cronut, the croissant taiyaki is a hybrid treat. Yup, you’ve got it, instead of a pancake batter filled, croissant taiyaki is made with croissant dough. They’ve got flaky, crispy, caramelized, crunchy outsides and creamy tasty insides. Seriously, there were one of the best treats I had. I did find a slight disparity between the different croissant taiyaki outlets, but not so much that you need to purposely seek out a specific branch. There are branches all over town, so if you see one, grab it like it’s hot! Personally, I like the custard cream the best, but they do seasonal flavors as well. Tsujita is a well known mini franchise that’s popular both in Tokyo and LA. It’s hilarious, because when we live in Tokyo, Tsujita is just our neighborhood ramen shop (along with many, many others). 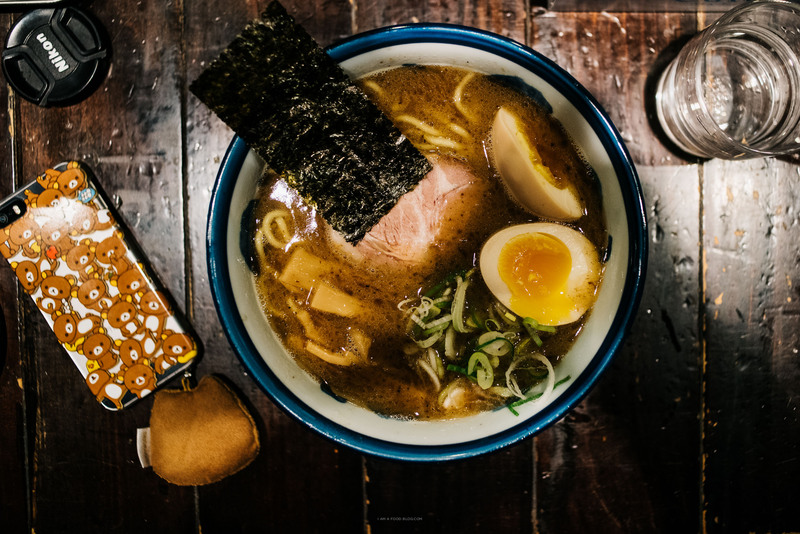 All of their branches specialize in different styles of ramen, but Tsujita’s main attraction is tsukemen, or dipping ramen. Mike had the tsukemen and it’s one of his top ten bowls. The noodles are thick, bouncy, and served with a wedge of sudachi lime. The dipping broth is super flavorful and full of bits of pork. When you finish your noodles, if you hold your bowl up, the staff will fill it up with hot unseasoned broth and you can drink the soup. Pictured here is their regular bowl of ramen, which was what I had. I like tsukemen, but usually, given a choice, I’ll go for regular ramen. 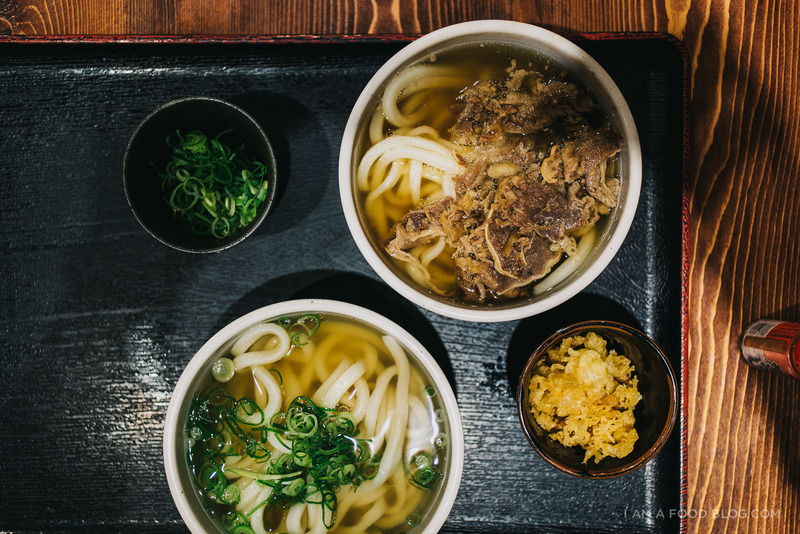 UPDATE: Check out our Tokyo Udon Guide! Ramen always gets all the love, but give me a bowl of udon any day and I’ll be a happy camper. 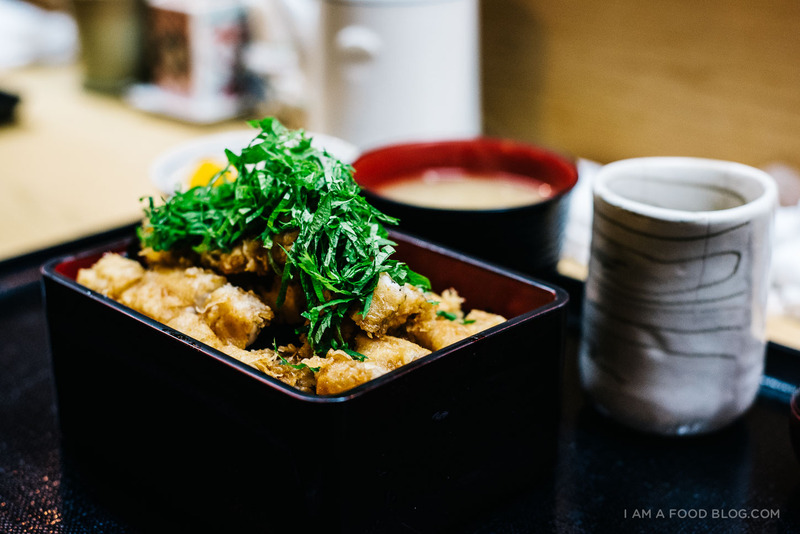 Menstudan, like so many other udon bars in the city, is an unassuming affair where you walk up to the counter, order your noodles, then head to the tempura bar to pick out your toppings. No big deal, right? Yes, and no – the noodles are hand made in store and the tempura, if you time it right, is hot and fresh. Bonus, there’s a DIY beer pouring machine that’s a little bit of extra fun. I love the udon texture and broth at Mentsudan, but if you don’t want to search for the one Mentsudan in the city, go to one of the many Marugames. They have kashiwa chicken, which is super juicy and crisp chicken breast tempura. 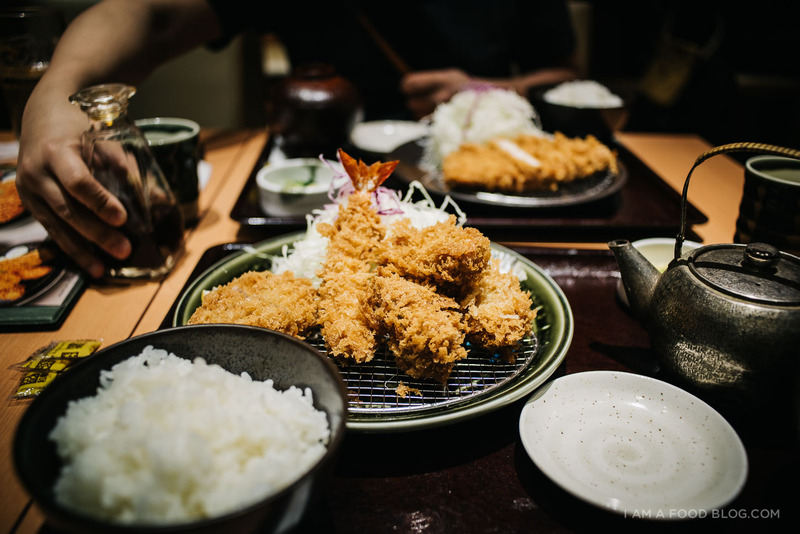 If you swear you don’t like chicken breast, all it will take is one bite of kashiwa when it comes fresh out of the fryer and you’ll be a chicken breast convert. I’d go to Marugame just for the kashiwa chicken. The udon is decent too! Oh, and if you think the name Marugame sounds a bit familiar, you’re right! They have outposts in other parts of Asia, as well as Hawaii. Afuri is one of my favorite bowls in Tokyo. They specialize in yuzu ramen and if you’re a fan of citrus, you’ll love the broth here. The yuzu is subtle, yet noticeable. The broth is a light chicken, fish, kombu affair and the noodles are thin, yet firm. The boiled eggs always have creamy orange centers and each slice of charsiu is charred a bit over an open flame. A tiny bit of yuzu zest sits on top of the egg and when you lean down to breathe in the smell of the delicate broth, you’re overwhelmed with hunger. The tsukemen here, according to Mike, is pretty damn good, but I’ve always been too busy devouring my own bowl to pay attention to anything else. Tsukemen might not be my favorite kind of ramen, but when you go to Gachi, you definitely want to have the chicken karaage tsukemen. 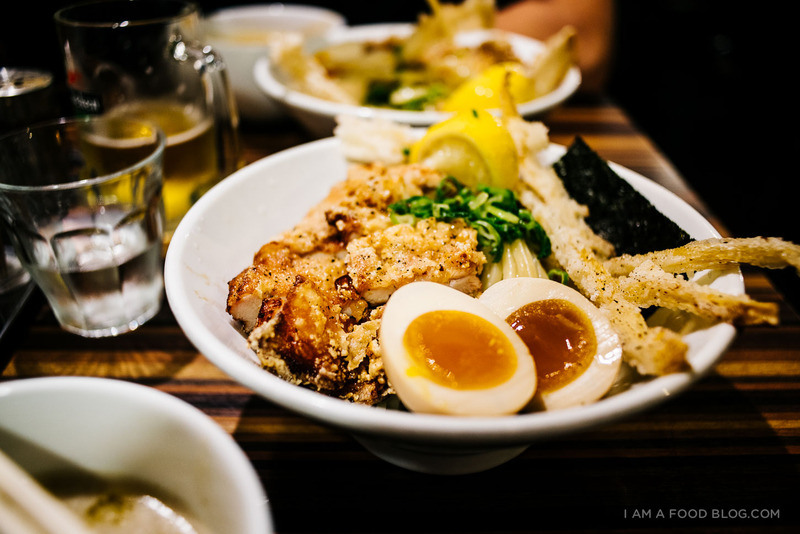 I have a very obvious thing for fried chicken and I’m crazy for noodles, so when Mike discovered this ramen joint that combined two of my loves, it was totally love at first sight. The fried chicken is karaage style, with a thin crispy batter. It comes with seaweed (of course), a perfectly soft-boiled egg, deep fried bamboo shoots and a wedge of lemon. The noodles were nothing spectacular, but the combination of cold noodles, hot dipping broth, and crunchy fried chicken is something I still dream about. It’s a good bowl of noodles. Soranoiro, and it’s sister shop, Salt and Mushroom, are a new breed of ramen shop that do free-style ramen. 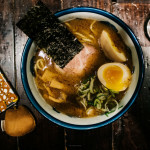 Ramen is relatively new to Japanese cuisine (I’m talking like 1900s new, but that’s still newer than soba, which came about in the 1800s) so it’s pretty open to interpretation and creativity. 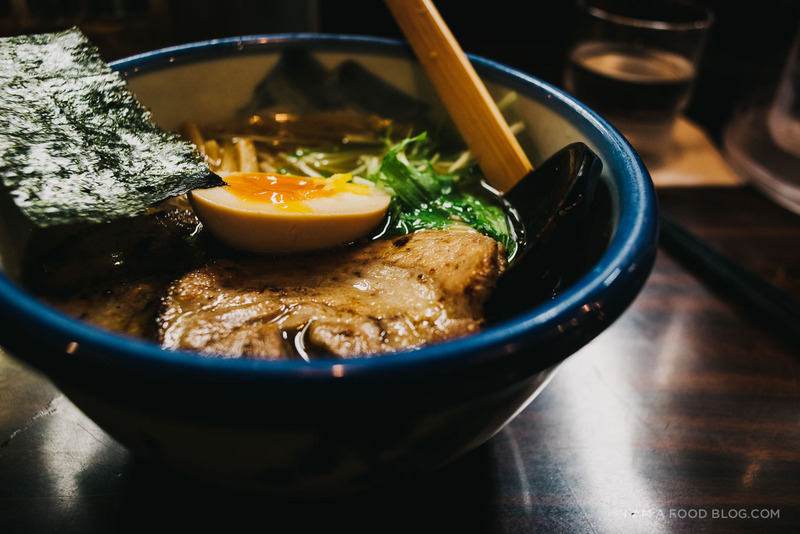 Free-style ramen tends to be fun and different, and while some bowls are just gimmicks, sometimes you come across a joint that just blows you away. Soranoiro is definitely one those places. They do a very, very solid bowl of shoyu (soy sauce based) ramen, but really, what you need to try are the specials and the veggie ramen. 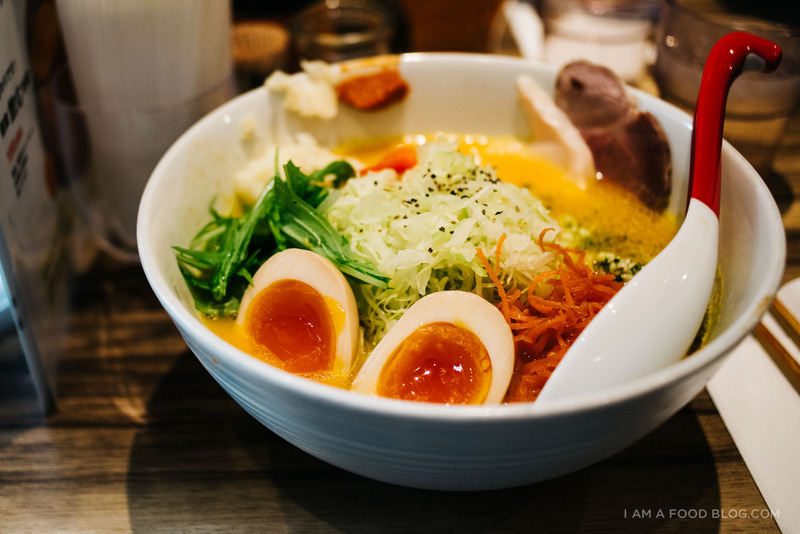 The veggie ramen comes with bright orange noodles — created with paprika for both color and flavor, the broth is similarly hued in orange from pureed carrots. There’s also an egg, a mess of vegetables, ham, and a slice of chicken. Because even though this is vegetable ramen, it’s by no means vegetarian. It is, however, a light and tasty bowl. But, if you have the chance to go, get the seasonal bowl. I had one topped with deep fried fish and eggplant and it sounds like it wouldn’t be good, but it was balanced, hearty, and delicious. Also, shout-out to the mushroom ramen at Salt and Mushroom. It wasn’t the prettiest bowl around, but it was so incredibly addictive. Whew! Did you make it?! I have to admit, it took me weeks to write this, on and off. But now it’s done!! Woot! I hope you guys make it out to Tokyo. It’s absolutely one of my favorite cities in the world. PS – If you made it all the way to the end, we need to grab a bowl of ramen together! Thank you for this guide! 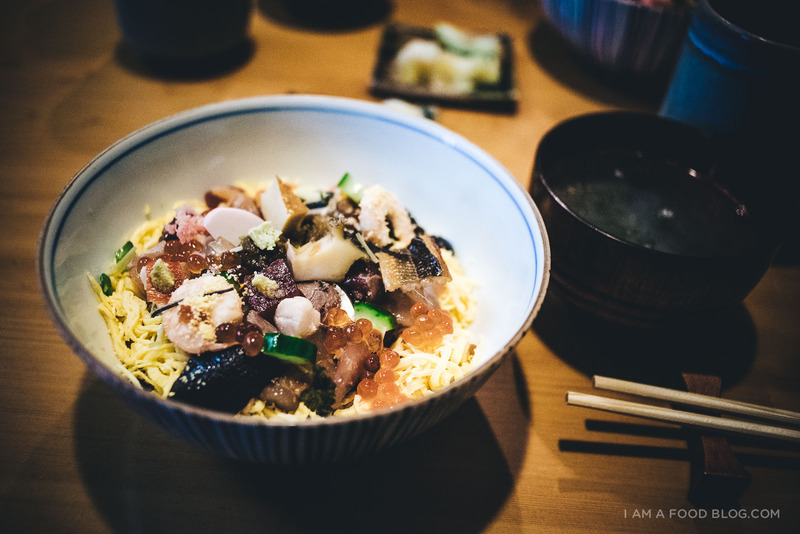 I lived in Tokyo for six months, and what I miss – every day – is the food. Never been to any of these places though, so I’m putting at least some of them up on my list for the next trip. Japan has always sounded interesting- more so because a number of my friends have made their way there over the past couple of years and have raved about everything. This definitely sealed the deal, and can’t wait to visit (preferably with a stop in Korea, too). Ooh a few new ramen joints! I have to check these out. Thanks for the guide! This all looks so delicious! Tokyo is a dream destination of mine so if I ever get there I’m sure this list will come in handy! Love it – definitely made it to the end. My husband and I are about to move to Tokyo in three weeks! We are so looking forward to the food! Do you have any recommendations for other blogs about Tokyo? THIS IS SPECTACULAR. You are just amazing, Steph!!! Thank you so so much for this! PERFECT timing for this post- my fiancé’ (as of like two days ago) and I are going to Tokyo on the 10th! I’ve marked down places from your previous posts, but now a larger guide, AWESOME! There’s also that toast place you wrote about back when you were in Tokyo. I happened to be traveling in Tokyo at the same time, so I got to check it out the day after you made the post, and it was SO AMAZING. Seriously. I *still* talk about it to everyone. Thank you so so so much for this!! Will hopefully to back to Tokyo next year, and will definitely try to hit up som of these spots!! Bookmarking this and begging Moses to take me so I can tick off every check box on this list. AMAZING round up and tips. Isn’t it crazy how long these take? And your guide is sooooooo detailed. Heart eyes and gratitude emojis forever. Oooh my gosh this brings back memories. I was in Tokyo last summer after my wedding and after dieting/going low carb for the wedding, I stuffed my face with rice/ramen/noodles/etc… Hehe, I did end up waiting atrociously long for Sushi Dai. It’s worth it. So so worth it. I want to go back! Oh my word, you evil temptress! I am dying to head over to Tokyo but getting there from South Africa is kinda hard! But my stomach is going to keep protesting until I do, so it’s time to start saving. Thanks for this guide… so informative! Can’t wait to go for myself. This is fantastic! We’re about to start planning our honeymoon to Japan, and we’ve got probably 4 days to schedule in Tokyo. I definitely don’t intend to plan out every second, but having an amazing list like this to draw ideas from is perfect. THANK YOU! I’m going to Tokyo in a couple weeks and am totally overwhelmed by my options. Thanks for the guide!!!! Edible Totoro is adorable. Hi Steph, thank you so much for these great tips for what and where to eat in Tokyo. My wife and i are going to be in Tokyo at the end of september. I’ll drop you an e-mail so we can take you up on your offer to grab a bowl of ramen together. this is the best blog ever i will go to Tokyo now thank you for inspiring me!!!!!!! the photography here is amazing! heading to tokyo in a few weeks and your blog and photos are helping me decide where to go eat. I’ll be visiting for the first time April and this guide is both getting me excited and making me so hungry! Thanks for the great tips and pics! I am with you , marugame is allways a good and cheap option ! Thank you for doing such a nice blog, makes me feel like a girlfriend’s personal recommendations! SO helpful. Can’t wait for visiting in a week! I made it all the way to the end! When are we grabbing some ramen? thank you so much for the invite though! Thanks so much for the write up/guide. It is so helpful! I bookmarked everything so try when I’m in Tokyo next month! My question one question is there anything around the cream puff place? the cream puff place is kind of in walking distance to shimokitazawa (20 minutes) which is a super fun area with lots of restaurants and shopping! Thanks heaps for this! It’ll be invaluable when I go to tokyo in a couple of weeks. I’m struggling to find many of these places on google maps though. Eg. One link doesn’t work, another goes to the japanese web site which I can’t read. Plus, all japanese roads in googles maps are in japanese. I just know I’m going to get lost. Any tips? Headed to Tokyo for my fourth time this weekend. I am definitely adding these spots to my list of go-to’s. Great blog, loved reading it. My daughter is 14 and is going to Tokyo for a month in the summer (I am so jealous!!) she is fixed up with a homestay family while she goes to school so breakfast and dinner are provided. How much do I need to give her a day to eat lunch? Like we are looking at here. I went 20 years ago for work but never paid for anything so I am in the dark. depends on where she’s eating, but i think 1000 – 1500 yen is more than enough! :) hope she has a blast! hi steph – i am a friend of molly yeh’s and longtime reader – my husband has happily gobbled up many of your recipes! thanks so much for this amazing resource! excited to hit up as many of these places as i can! i’m wondering if you have any reocmmendations for places to stay (whether ryokan, hotels, airbnbs) in tokyo / osaka / kyoto ? i am heading to japan in a few weeks and am feeling covered food-wise, but unsure of the best type of place to stay. thanks so much!!! Great write up!! Bookmarked for my upcoming trip! Thanks for this! Im adding all of this to my list when I go next month. Great blog! Love the mouth-watering photos! Just landed in Tokyo, and I was looking for something more organic than Trip Advisor recommendations. I will report back with what I find. Thank you! Thanks for sharing! This is a great list that we took to Tokyo last week. We did make it to Mentsudan and it was excellent. Another great bowl of udon we had was at a place called Kurosawa in Roppongi!. Also using Tokyu Stays on Airbnb, staying near Otsuka station. Has been a dream for some years so I cannot wait. Thanks for your tips, it will make our dining out more interesting! Like the post but it would be a lot better if you had location, price, and wait time (if any). Heck yes! I love Japanese food and this post not only speaks to my stomach but also my heart. One of my fav things to put together for a quick weeknight meal is okonomiyaki, a savory pancake you eat with okonomiyaki sause (a little like hoisin). OMG, so many amazing places to check out. Thank you for this list! I will be visiting Tokyo in April 2017! New visitor to your site but love your list of hole in the wall places for lunch. 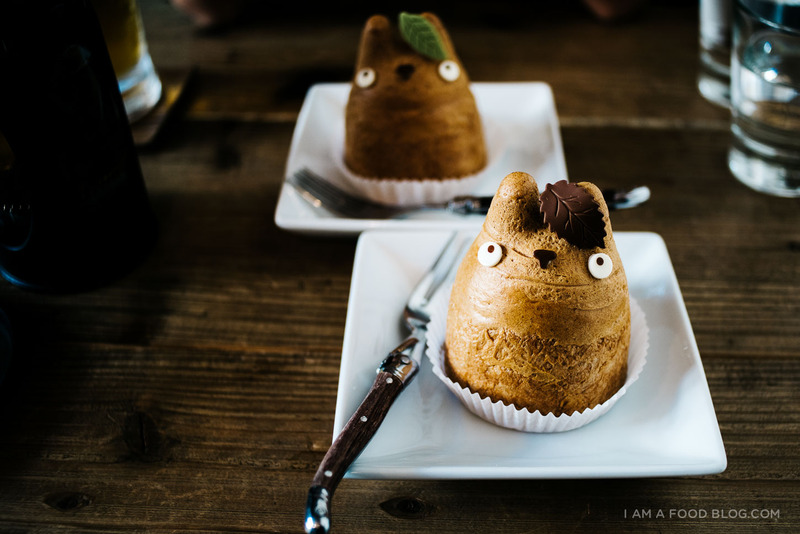 The totoro puff factory will be a must for me! Some of these foods look amazing! I absolutely love cream puff….i love how some of the words link to different restaurants and places. When I visit I will be sure to go to the Cream Puff Factory. Thank you so much. What do you recommend to eat my first meal in Japan at? This is perfect! Jimmy (my version of Mike) and I just made the decision to drop the other countries we were planning to go to and just honeymoon in Japan. We know most of the attractions we want to hit up but aside from a couple restaurants we were just going to roam the streets (still part of the plan) I too prefer ramen over tsukemen (as seen any time I go to the Tsujita in LA) but noodles is noodles and honestly, from the bowls I tried the last time in Tokyo/Kyoto, I’m pretty sure you just can’t go wrong. Anyways, thanks for the list, I’ve been to Wako and Tsukiji and have a love to Totoro so I look forward to trying some of these places out. I know you wrote this a year ago and don’t know how serious you were, but if you ever end up in San Diego, we don’t have a ton of mind blowing joints to grab a bowl, but we have a couple and Jimmy and I would love to grab a bowl together! A million times, thank you! I’m going to Japan in April and I’m trying to plan my travels but since there is so much choice, it makes it really hard to make a decision. Your list is soo helpful! Everything is so on point here. I love Tokyo and it’s the first city I fell in love with everything. The food, the nightlife, the busy streets, visiting parks and temple hopping. But then, the most favorite activity I love to do is eating. Thanks for this guide, I want to check the other places on where to eat as well. Thanks for the info, I ❤️Ramen, any kind of noodles actually. Tsukemen is one of my favorites but don’t find it very often, so now, I have a few places to ✔️ out. He is a meat and potato kinda guy – any good steak recommendations? ooh steak and potatoes…definitely ushi no kura if you want a japanese experience! Wow, I am speechless! First off, I love your photos. Secondly I’m so jelly of all the foods you had in Tokyo, I will definitely need to consult this when I go. Thank you for sharing! thank you for the great spots in Tokyo! It is definitely one of my favorite cities to visit and eat. I will be returning soon and trying the spots you have recommended. I love how you capture the food in all your photos!